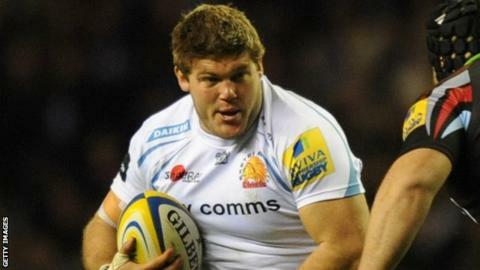 Exeter prop Alex Brown says he would like to sign a new deal with the club. Brown in April 2012 from Championship club Doncaster and by head coach Rob Baxter 11 months later. "I'd love to stay. I love it down here and it's become my home," Brown said. Brown says his time on loan with Plymouth, where he featured in their draw at Yorkshire Carnegie, has served him well. "The important thing is you're just playing rugby games at this time of the year," he continued. "One of the important things that Rob wants to see is the boys playing rugby. "You don't usually get much game time in A League rugby and training is just training. You want to be a professional rugby player, you don't want to be a professional trainer." But Brown is keen to emphasise that the Exeter team, who are third in the Premiership and top of their European Challenge Cup and LV= Cup groups, is more important than his personal future. "It's a part of constantly improving, I don't think it's just about a summer deal," added Brown. "Everybody strives to be the best player they can, so as soon as you start thinking like that, you start making decisions that can be selfish and to the detriment of the team. "You want to be a team player and play the best you can for the rest of the boys."